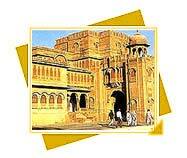 We give history of Bikaner with complete information about the city and its appearance. 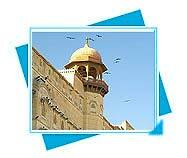 The history of Bikaner is very twisted with the stories of royal Maharaja, with grand Mughals. Bikaner history stands with it many spiritual details and facts that make it rather more attractive for travelers and tourists from all over the world. More popularly called the camel country, the city is renowned for the best riding camels in the world. The ship of the desert is an inseparable part of life here. 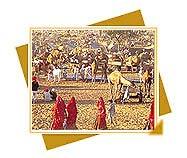 Be it pulling heavy carts, transporting grains or working on wells, camels are the prime helpers. The wells of Bikaner: an important source of water is other attractions of the city. These are built on high plinths with slender minareted towers on each of the four corners and can be noticed even from a distance. Binaker's history dates back to 1488 A.D. when a Rathore Prince, Rao Bikaji- a descendant of the founder of Jodhpur (1459 A.D.), Rao Jodhaji, established his kingdom here. Rao Jodhaji had five sons but Rao Bikaji was the most enterprising of them. Bikaji chose a barren wilderness called 'Jangladesh' and transformed it to an impressive city, called Bikaner after the founder' name. The history of rural Bikaner began with a "remark" approved by Rao Jodha, the ruler of Jodhpur that led his son Rao Bikaji brave the formidable Thar Desert and set up a fortress called Bikaner in the 15th century. 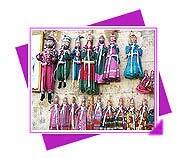 The history of Bikaner, Rajasthan, India is generously spread with the birth, growth and constant surfacing of arts and crafts such as camel leather goods, silver and gold items and beautiful embroidery styles. History shows that Bikaner was always locked in battles with the Mughal Empire, but later forged a friendship with Emperor Akbar. But with the refuse of the Mughal dynasty, the city of Bikaner experienced another setback. Afterwards, the rulers of Bikaner later signed a treaty with the British and remained loyal to them till it was merged with the other generous states to form the state of Rajasthan, which finally became a part of independent India. One of the most imposing forts of Northern India-- Junagarh Fort has remained unconquered till date. Coinciding with the festival of Gangaur the Mewar festival is celebrated to welcome the advent of spring.